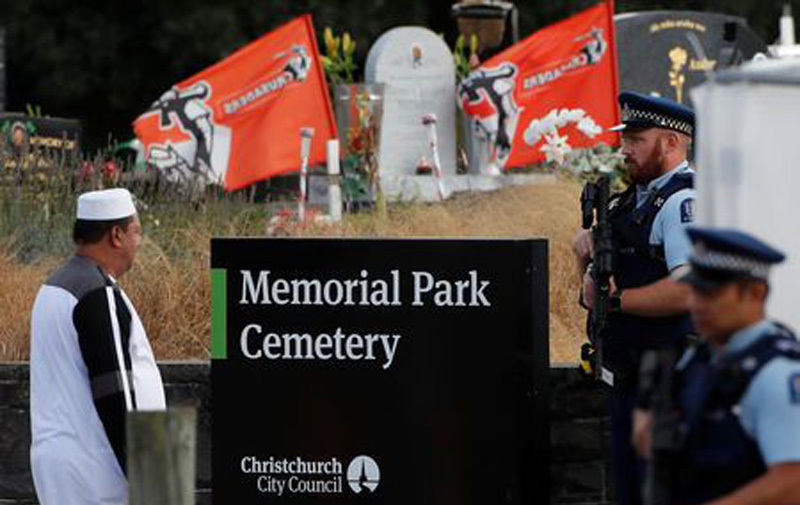 The bodies of victims from New Zealand’s mosques mass shooting were carried in open caskets on the shoulders of mourners into a large tent at Christchurch’s Memorial Park Cemetery on Wednesday – the first burials of the 50 victims. Wrapped in white cloth, the bodies were laid to face Mecca, and, after jenazah (funeral) prayers, were carried towards their freshly dug graves. “Seeing the body lowered down, it was a very emotional time for me,” said Gulshad Ali, who had travelled from Auckland to attend the first funeral. Several mounds of dirt piled high marked the site of multiple graves which will be used for New Zealand’s worst mass shooting. Hundreds gathered to mourn, some men wearing a taqiyah (skullcap), others shalwar kameez (long tunic and trousers), while women wore hijabs and scarfs. The first two victims buried, father and son Khaled and Hamza Mustafa, came from war-torn Syria. “I cannot tell you how gutting it is…a family came here for safety and they should have been safe here,” said Prime Minister Jacinda Ardern, visiting the city for the second time since the massacre. Heavily armed police stood watch with flowers tucked in their revolver holsters and attached to their high powered rifles. Six victims were buried on Wednesday, with more expected during the week. Ardern said this coming Friday’s call to prayers for Muslims in New Zealand will be broadcast nationally and there will be a two minute silence on Friday. “There is a desire to show support for the Muslim community as they return to mosques on Friday,” she said. The bullet-ridden Al Noor mosque, where more than 40 people died, is being repaired for Friday prayers. Near the mosque, members of rival gangs did a Maori haka, a powerful indigenious ceremonial performance, and a crowd of people sung New Zealand’s national anthem as the sun set. The Australian National Imams Council has called on Imams to dedicate this Friday’s Khutbah (sermon) to the Christchurch mosque mass shooting. “The attack on any Muslim or any innocent person anywhere around the world is an attack on all Muslims and all people,” the council said in a statement. New Zealand’s police chief said global intelligence agencies, including the U.S. Federal Bureau of Investigation and those from Australia, Canada and Britain, were building up a profile of the alleged shooter. As of Tuesday night 21 victims had been identified, with the remainder expected to be completed on Wednesday before their bodies can be released for burial, police said. “You cannot convict for murder without that cause of death. So this is a very comprehensive process that must be completed to the highest standard,” he said. She has refused to mention alleged gunman Tarrant’s name, saying he does not deserve publicity. Ardern earlier visited Cashmere High School in Christchurch which lost two students in the attack – teenagers Sayyad Milne and Hamza Mustafa – plus Hamza’s father Khaled, and a former student Tariq Omar. “Never mention the perpetrator’s name … never remember him for what he did,” she said, asking the children to focus on the victims.